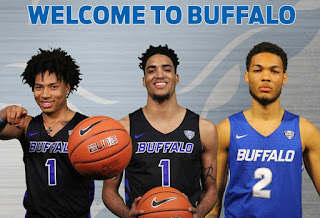 BUFFALO, N.Y. -- Head men's basketball coach Nate Oats has announced the signing of three players for the 2019-20 season, who all signed National Letters of Intent on Wednesday. Included in the class are James Rojas, Durey Cadwell, and Andre Allen. "Losing five seniors this year, this class was huge for our program and I am extremely happy with the three players we have signed in this class," said Oats. "Andre and James give us some skilled players on the interior which are different than what we have and Durey is an extremely talented guard that will fit in well with our system." Rojas, a 6-7 forward, is a local product from Jamestown, NY, the same hometown as assistant coach and recruiting coordinator Bryan Hodgson. Rojas is currently playing junior college ball at Hutchinson Community College where he has averaged 18.0 points per game through the first five games this season, including 28 points in their most recent game against Redlands Community College. Last season, Rojas helped lead Hutchinson to a 29-7 record and a 21-5 mark in conference play as he averaged 10.6 points per game. He went over 20 points four times last year as Hutchinson made it to the second round of the national tournament. Rojas was a 2017 All-Western New York First Team selection at Jamestown where he averaged 27.1 points, 11 rebounds, and 3.5 assists per game as a senior. "We are extremely excited to get James back to Western New York," said Oats. "He is a player we have targeted for a long time and he brings a toughness to the gym every time he steps on the floor. He can shoot the ball well and he is smart on both sides of the ball." Cadwell is a 6-5 wing player from Houston, TX, who is playing at Daytona State. Cadwell is a freshman currently at Daytona State and will have three years of eligibility when he joins the Bulls. Cadwell has averaged 10.0 points and 4.5 rebounds through the first four games for Daytona State this year including 22 points on 7-of-8 shooting against Denmark Technical College. Cadwell played his high school basketball at Klein Forest High School where he was a second-team all-league selection in 2017. "Durey is a big guard who can really shoot the basketball," said Oats. "He will have some college experience, but will still have three years of eligibility. He is a great athlete and an excellent ball handler. He is going to follow in the footsteps of a great guard from Texas in CJ Massinburg, but I know he is up for it." Allen is a 6-9 forward from Los Angeles, CA who is currently playing junior college ball for Arizona Western Community College. Allen is averaging 13.0 points and 10.0 rebounds per game through five games this year, including 19 points on 6-of-10 shooting against Imperial Valley College. Last season, Allen and Arizona Western went 23-10 and 16-6 in league play. He had a career-high 27 points last year against Tohono O'odham Community College. He played his high school ball at Balboa City School, the same high school as number one NBA Draft pick DeAndre Ayton, where they went 34-6 during his senior season. Allen scored 23 points and 10 rebounds in a game against Victory Prep, which featured current Denver Nugget, Jarred Vanderbilt. Allen steadily improved during his high school career, earning the Instant Offense award back during his sophomore season. "Andre is extremely athletic and he will be great in transition," said Oats. "He has a long wingspan and is a great shot blocker. I also believe that he is the best passing big I've ever coached and he will fit in great with our program." "With these three entering our program this year, and adding Antwain Johnson and Gabe Grant to the mix who are sitting out the year due to NCAA transfer rules, I am extremely excited for the future of this program," Oats added. Currently ranked #25 in the nation, the 2018-19 Bulls will return to the floor a week from today when they host Dartmouth at Alumni Arena at 7:00 pm.